A New Brunswick judge has lifted a publication ban on previously reported details about the Fredericton shooting a week ago that claimed the lives of two city police officers and two civilians. 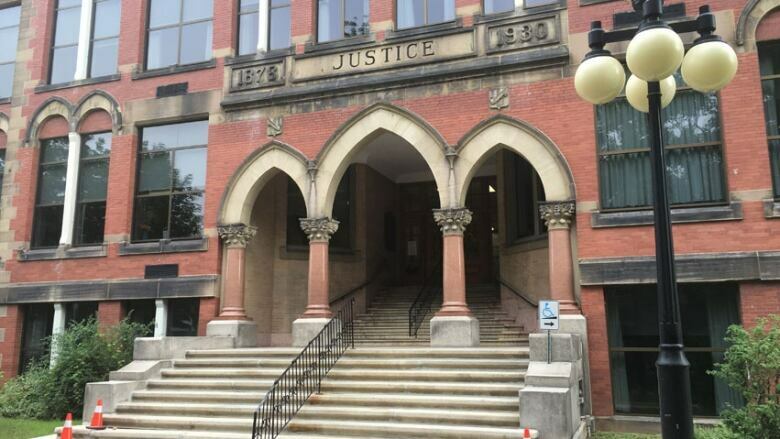 Court of Queen's Bench Justice Judy Clendening delivered a brief oral decision Friday morning after CBC News and other media outlets had challenged the retroactive order during a hearing in Fredericton on Wednesday. The names of officers who responded to the 911 calls. Their movements at the scene. The apprehension of the suspect. The unsealed document reveals the alleged gunman was shot in the abdomen by police as he fired out an apartment window at 237 Brookside Dr. with a long gun. 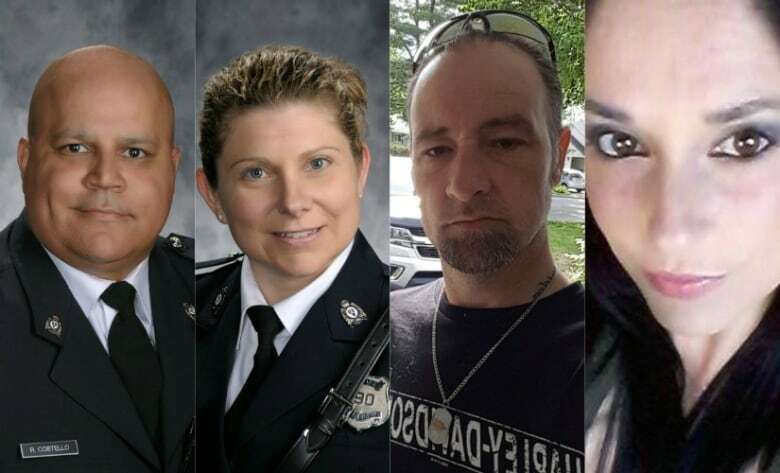 Matthew Vincent Raymond, 48, is charged with four counts of first-degree murder in the deaths of Fredericton Police Force constables Robb Costello, 45, and Sara Burns, 43, and civilians Donnie Robichaud, 42, and Bobbie Lee Wright, 32. Raymond is scheduled to appear in court on Aug. 27. Victims of the Aug. 10 shooting from left to right: Const. Robb Costello, 45, and Const. Sara Burns, 43, Donnie Robichaud, 42, and Bobbie Lee Wright, 32. The publication ban was initially ordered by Clendening on Monday at the request of the Crown's office, just hours after some new information about the shooting was reported. The information came from a legally obtained document filed in provincial court in Fredericton. Cameron Gunn, director of specialized prosecutions, told the court Wednesday that the document — the prosecutor's information sheet — was "inadvertently filed." The Crown amended its application Wednesday, seeking a more "narrow ban" than what was previously filed, seeking to suppress only the names of the responding officers and the civilian who called 911, citing "privacy interests." But media lawyer David Coles argued the judicial process in Canada is open and "you can't put the genie back in the bottle." A 2005 Supreme Court of Canada decision stipulates parties seeking to restrict media access to court documents must demonstrate that the information poses a serious risk to the administration of justice — the so-called Dagenais/Mentuck test, he said. In her decision Friday, Clendening noted the investigating RCMP officer acknowledged it was an "oversight" on his part that the prosecutor's information sheet was attached to the basic identifying information filed with the court. "It was unfortunate that it found its way into the public file and it was also unfortunate that before the information was released it was not brought to the attention of a judge of the provincial court for further direction," she said, reading her eight-page decision aloud. She concluded the "evidence falls short of establishing that a ban should be granted." "I do not find that the salutary effects of granting the publication ban strongly outweighs the deleterious impacts." Coles was pleased with the decision. "While I do not believe there was any evidence to justify issuing the first ban and injunction requiring unpublishing, the court moved quickly to correct the situation," he said in an email. Under Clendening's initial ban, the media could not "publish, broadcast, re-broadcast, transmit, re-transmit, or disseminate," any of the information gleaned exclusively from the prosecutor's information sheet until the end of the criminal proceedings, which could take months, or even years. Monday's order also required media outlets to remove from publication any information from the court document that had already been published. Clendening did not provide reasons Friday for why she had granted the order. 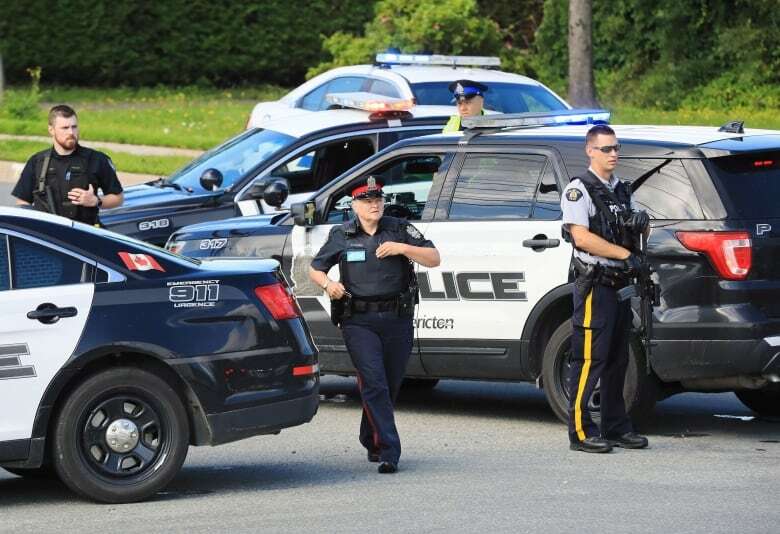 Fredericton police responded to reports of gunfire at the apartment complex on Aug. 10 at 7:10 a.m. AT. Costello and Burns were the first officers to arrive on scene and were followed closely by Sgt. Jason Forward. As Forward stopped to ask a passerby some questions, Costello and Burns went into the driveway at 237 Brookside Dr., in the back of Building C. The court document shows Raymond lived in Apartment 11 of that building. Costello and Burns were shot and killed trying to help two civilians — later identified as Robichaud and his girlfriend Wright. Forward heard gunshots and followed the noises to the back of Building C, where he found Costello and Burns "on the ground not moving," along with another male, also not moving. The suspect continued shooting as Forward and another officer, identified only as Const. Fox, entered the apartment building together and set up "containment" in the stairwell to the top floor. A third officer, identified only as Const. Arbeau, fired at the alleged shooter "after Arbeau observed the individual point a long gun weapon at him," the document states. Wright was found dead near the other victims on the passenger side of her vehicle with a blown-out windshield, according to the document. Police have said the long gun they believe was used in the shooting is commonly available for purchase, and is not a prohibited or restricted weapon. A regimental funeral for the fallen officers will be held Saturday at 1 p.m. AT at the Aitken University Centre. It will not be open to the public, due to limited seating. Thousands of law enforcement personnel and first responders from across North America are expected to attend, Deputy Chief Martin Gaudet has said. Citizens are invited to watch the procession parade, which is scheduled to start at noon at Fredericton High School. The funeral service will be live-streamed at two locations — the Grant Harvey Centre and Hope City Church, formerly known as Sunset Church, said Gaudet. CBC News will broadcast the funeral procession and service from noon until about 2 p.m. — on CBC News Network and the main network, on radio, online at cbc.ca/nb and on Facebook. The other media consortium members involved in the legal challenge included CTV, Postmedia, the Globe and Mail, Global and Brunswick News.